The following rules and requirements (the “Official Rules”) govern the Back to School Contest (“Contest”). Please read these Official Rules before entering the Contest. By submitting an entry, you acknowledge that you have read, understand and agree to be bound by these Official Rules and the decisions of Capital Brands, LLC (“Sponsor”) the contest Sponsor. The contest begins on August 1 st 2016 at 12:00:00 am PST and will be open until August 31 st 2016 at 11:59:59 pm PST (the “Entry Period”). The ten winning entrants will be selected on September 1 st , 2016. The computer clock of Twitter is the official time-keeping device in the Contest. Go to www.Twitter.com and login to your account. Go to the official Magic Bullet Twitter account and Re-Tweet or Tweet Quote the contest related Tweets. When Tweet quoting, entrants must use the hashtag #B2SchoolMagic. (d) Copyright: By submitting any kind of photo when Re-Tweeting or Tweet Quoting and thereby entering the Contest, you agree to hold Sponsor harmless from all liabilities, including costs and attorneys’ fees, from your breach of this or any other representation (specifically, see section 7 below) and warranty set forth in these Official Rules. (a) At the close of the Entry Period, all submissions by eligible Contestants will be voted upon by the Magic Bullet internal team (“Judges”) chosen by Sponsor. The Judges will select the winner (who are the five entrants chosen above). The winners will be contacted by September 1 st , 2016. The criteria used to evaluate the winners will include, but not be limited to, Re-Tweets or Tweet Quotes including the specified hashtags. (b) For Winners’ Names: As an alternative to seeing the names of the winners on the Magic Bullet Twitter page you may also, after September 30 th 2016, send a self-addressed, stamped envelope to: Back to School, Capital Brands, LLC, 11601 Wilshire Blvd, Suite 2300, Los Angeles CA 90025. 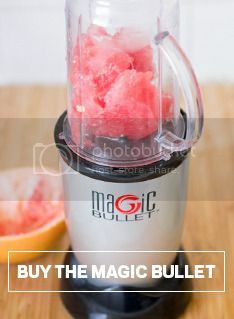 (a) Ten (10) eligible entrants, selected as winners, will win a Magic Bullet system, (approximate retail value $39.99). If you are a winner you will be notified by September 1 st , 2016 via Twitter from The Magic Bullet account. All winners will have 48 hours to reply and confirm their eligibility before another winner is chosen in their place. Each winner will be required to sign and return, when requested, a Declaration of Compliance and Release. Contest materials, entries and submissions are subject to validation by the Sponsor. By taking part in this Contest you agree to be bound by these rules and all decisions of the Judges and Sponsor, which are final and binding on all aspects of the Contest. This Contest is not sponsored, endorsed, approved, or administered by Twitter, Inc.